What’s an easy and fun way to get your children to eat their greens? Well why not encourage them to plant up their own fruit & vegetable box? 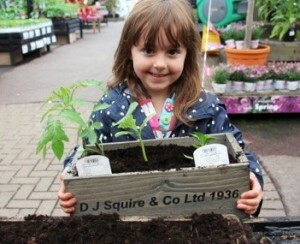 Squire’s Garden Centres are running a great activity at May Half Term where children can plant a box with a choice of three tasty plants to grow and take home. They can choose from pepper, lettuce, tomato or strawberry plants. Children can also take part in a free Veggie Hunt. Simply follow a trail of questions around the garden centre then receive a sticker at the end. Squire’s “Create & Grow” Half Term activities run from Monday 29th May – Friday 2nd June. There’s no need to book, just come anytime from 10am-4pm.